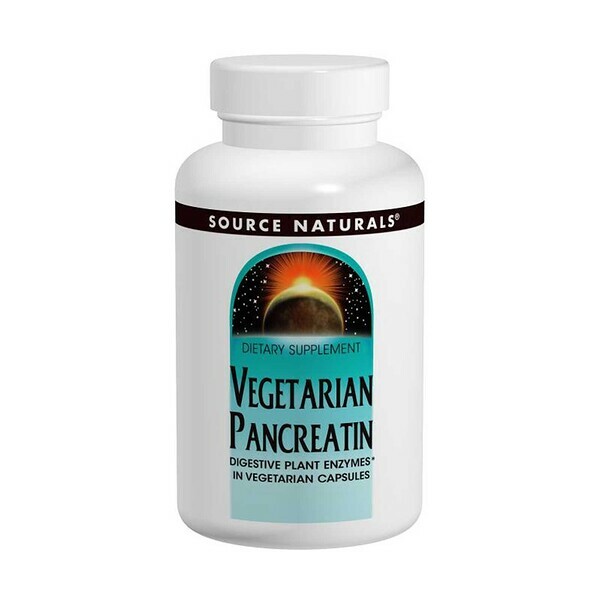 Source Naturals Vegetarian Pancreatin is a broad-spectrum plant-based enzyme blend. It includes protease for protein breakdown, amylase for starch breakdown, and lipase for fat breakdown. Unlike pancreatin derived from animal sources, vegetarian pancreatin works at a wide range of pH levels to break down food in the acidic stomach as well as the more neutral intestines. Plus, vegetarian pancreatin can help digest wheat, gluten, which may increase stomach and intestinal comfort. Supplementing the body's digestive process with enzymes is of great value in today's fast-paced society. Suitable for vegetarian. Contains no dairy, egg, gluten, soy or wheat. Contains no sugar, starch, salt, preservatives, or artificial color, flavor or fragrance.